California-based Westland Real Estate Group has purchased two Las Vegas apartment communities for $60.3 million. The complexes are Liberty Village Apartments at 4870 Nellisoasis Lane and Village Square at 5025 Nellisoasis Lane. Between the two there are 1,129 units. Cannabinoid Remedies LLC signed a 63-month lease for 1,000 square feet of retail space at Pecos Russell Plaza located at 3380 E. Russell Road, Suite 105. Wayne Shafer signed a 37-month lease for 1,200 square feet of industrial space located at 7225 Bermuda Road, Suite H.
Robin Willet and Devin Lee of Northcap Commercial represented the buyer. Spence Ballif of CBRE represented the sellers, Shamrock Properties VI LLC and Shamrock Properties VII LLC in the transaction. • A sale to 4590 W. Sahara LLC. 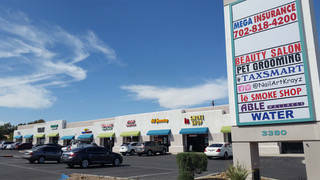 The 7,930-square-foot retail strip center, the Sahara& Decatur Retail Shops is at 4590 W. Sahara Ave. The transaction value was $2,475,000. David A. Grant of Colliers International represented the seller, McLarenLas Vegas LP. • A sale to Tabs Realty LLC. The 9,555-square-foot industrial property is in the Martin Hinson Business Center at 6683 Schuster St. The transaction value was $1,700,000. Greg Pancirov, SIOR, and Mike De Lew, SIOR, of RealComm Advisors represented the buyer. • Zac Zaher of CBRE, Inc. represented the seller in the sale of a 9,555-square-foot industrial building at 6883 Schuster St. to Tabs Realt, LLC for $1,695,000. • A sale to Alexandra Building LLC. The 4,994-square-foot medical office property is in Horizon Ridge Professional Park at 2380 W. Horizon Ridge Parkway in Henderson. The transaction value was $1,375,000. Stacy Scheer, CCIM of Colliers International represented the buyer. • A sale to Souza Land Properties LLC. The 4,190-square-foot industrial property is in Sunset Pointe Industrial Center at 569 W. Sunset Road in Henderson. The transaction value was $691,350.00. Greg Pancirov, SIOR, and Mike De Lew, SIOR, of RealComm Advisors represented the seller, Sunset Pointe Group LLC. • A sale to Realterm Logistics. The approximately 25,000-square-foot industrial property is in Nellis Industrial Park at 4101 E. Lone Mountain Road in North Las Vegas. Dan Doherty, SIOR; Paul Sweetland, SIOR; Chris Lane; and Jerry Doty of Colliers International represented the seller, XPO Logistics Freight Inc.
• A lease to Julio Amezcua. The 2,708-square-foot retail property is at 2517 Stewart Ave., Suite 2517. Al Twainy, CCIM, and Amelia Henry of Colliers International represented the lessor, Stewart Ave Trust. • A lease to Canyon Nevada LLC. The 2,695-square-foot medical office property is in Shadow Professional Center at 400 Shadow Lane, Suite 210. Stacy Scheer, CCIM; Patti Dillon, SIOR; and Taber Thill, SIOR, of Colliers International represented the lessor, Fullerton Vegas Shadow Lane LLC. Alexia Crowley, CCIM of Colliers International represented the lessee. • A lease to T&C Cap Plus. The 2,450-square-foot retail property is in Rancho Alta Mira at 4900-4990 W. Craig Road. Scot Marker of Colliers International represented the lessor, CW Asset Management. • A lease to Mark Down Liquidators LLC. The 1,846-square-foot retail property is in Tropicana East Shopping Center at 4780 S. Eastern Ave. Chris Clifford, Steve Neiger and Brett Rather of Colliers International represented the lessor, Tropicana East Shopping Center. • A lease to Fashion Evolution Enterprise LLC. The approximately 1,100-square-foot retail property is in Tropicana East Shopping Center at 2470 E. Tropicana Ave., Suite A. Chris Clifford, Steve Neiger and Brett Rather of Colliers International represented the lessor, Tropicana East Shopping Center. • A lease to American Building Systems LLC. The 3,975-square-foot industrial property is in Black Mountain Pointe at 126 Cassia Way, Suite 100, in Henderson. Greg Pancirov, SIOR, and Mike De Lew of RealComm Advisors represented the landlord, AISSAC LLC. • A lease to Aircraft Service International, Inc. d/b/a Menzies Aviation. The 6,760-square-foot industrial property is in Marnell Air Cargo Center at 6055 Surrey St., Suite 120. Greg Pancirov, SIOR, and Mike De Lew of RealComm Advisors represented the landlord, MCP Cargo LLC. • A lease to Sunset Spas of Nevada LLC. 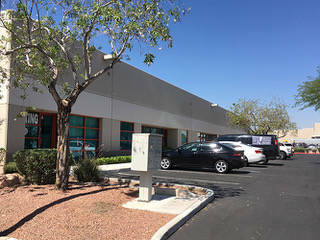 The 5,768-square-foot industrial property is in Valley Freeway Center at 7705 Commercial Way, Suite 150, in Henderson. Greg Pancirov, SIOR, and Mike De Lew of RealComm Advisors represented the landlord, Valley Freeway Industrial Park LLC. • TruGreen Limited Partnership renewed a lease of 5,720 square feet of industrial space in Harsch Valley Freeway Commerce Center at 7665 Commercial Way. Zac Zaher of CBRE represented the tenant. • Wayne Shafer signed a 37-month lease for 1,200 square feet of industrial space at 7225 Bermuda Road, Suite H. Matt Feustel of Virtus Commercial represented the lessor, Bermuda Vegas Investment LLC, in the transaction. • Artesanias Mi Pueblo LLC signed a 61-month lease for 1,200 square feet of retail space at Stewart Square at 235 N. Eastern Ave., Suite 130. Matt Feustel of Virtus Commercial represented the lessor, Miller Trust Etal, in the transaction. • Cannabinoid Remedies LLC signed a 63-month lease for 1,000 square feet of retail space at Pecos Russell Plaza at 3380 E. Russell Road, Suite 105. Matt Feustel of Virtus Commercial represented the lessor, 3380 Partners, in the transaction. • Island Frozen Yogurt renewed 2,024 square feet of retail space for 61 months at Black Mountain Marketplace at 76 W. Horizon Ridge Parkway, Suite 155, in Henderson. Chris Emanuel of Virtus Commercial represented the lessor, BLK MTN, LLC & BLK MTN 2,LLC, in the transaction.